Hey guys! This is an update for last week (The 28th)! Last week I covered some Basic Mac information, so checkout the full page to get acquainted with your new Mac Desktop! This is your Basic Mac Desktop! 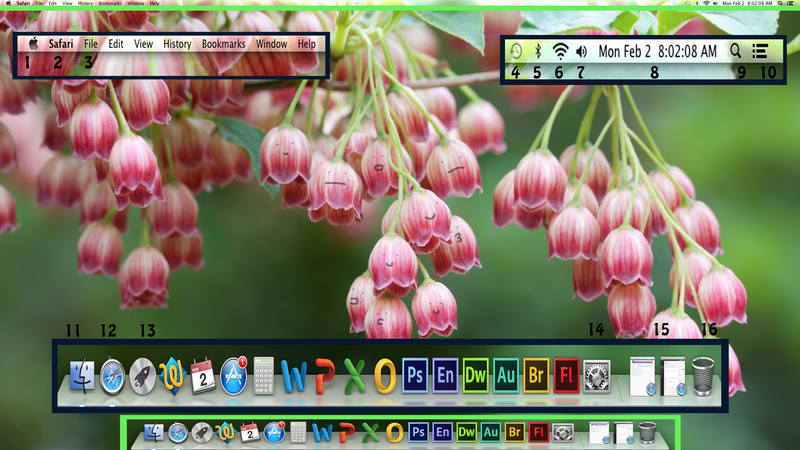 First off; Those two Green areas you see are your Finder Bar, and Your Dock – Key essentials to a healthy running mac! This is the Apple Menu, where you can restart or shutdown your station, navigate to updates or system preferences, and where you can find the force quit menu to end processes that aren’t responding. Very helpful for when Photoshop throws a fit! This is your ‘Active Window’ Menu. If you’re in Safari, you’ll see Safari – If you’re not using a window or program you’ll normally see Finder up there instead. Use this when you’re setting up your station to view multiple windows! These are your basic editing tools, just like you would see along the top of a PC’s windows! Here you can save webpages, create bookmarks, copy/paste, and all the fun things you gotta do to get things done. There’s also a nifty Help button at the end that you can type full questions in! This is your Bluetooth Indicator! It let’s you know when Bluetooth is On/Off, Disconnected, Transferring Media, etc – This is pretty handy when you have photos on your phone that you’d like to use in PS or other editing software. Your Precious – The Wifi Indicator! Seeing this icon in black means you’re connected to a wireless network, which is great – it’s what we want to see! But don’t be fooled – Just because it’s highlighted in Black, doesn’t mean you have internet connection! Sound Indicator – For those times when you just don’t want to hit the F11 and F12 buttons to turn your sound up and down. Date & Time – Having the Date and Time displayed in the upper right is great! It helps you keep track of how much time you’re wasting, and how productive you’re actually being that day. SPOTLIGHT! This is your search of all searches tool – Once you click it, a nice blue box will appear for you to type in, much like the help bar, and you’ll be able to search for applications, programs, and get this – Websites and Webpages! Spotlight can act like a Google Search and find the top 3-5 sites that hold information about what you’re searching. Notification Center – For those of us with iPhones and iPads, this will be familiar! This is where you can access a whole host of different things, from e-mail to calendar events, to reminders and even application notifications such as when it’s time to collect gold from the people of your glorious kingdom! It can be customized to your liking, same as the iOS devices! Finder! This is your file keeping, main OS operating friend. You’ll always have finder open, same as always having Windows OS open all the time! But let’s not kid ourselves, Finder throws fits just like any other program, and just like other programs – Finder can be relaunched in the Force Quit Menu. This is Safari – Many of you are already familiar with this icon because the first thing anyone does on a computer is go to the Internet. Safari is the Mac based equivalent to Internet Explorer, and is used for all your internet needs. Launch Pad! This little guy here is your helper in getting to all your applications without having to open a Finder window. This is similar to how the new Windows 8 start page is laid out. It’ll have all your apps on screen, and you can scroll left or right to find more. This is your System Preferences icon – Most of us know what this is, and how it controls A LOT of how we interact with our Macs – You can use this just like the Control Panel in Windows, so no worries on learning new terminology and getting confused – It’s all laid out for you! These are “Open Application Windows” – They hangout here so that you know what you’ve got open in what program. This is handy for when your desktop is getting over crowded and you just need to minimize a few things. And finally – Your Trash! Whenever you delete or Send a File to the Trash – This is where it goes! It never fills up and you can throw anything in it, even applications! But please remember to take out the Trash every so often, or you’ll experience some major system lag! And that’s it! All your basics in one go!